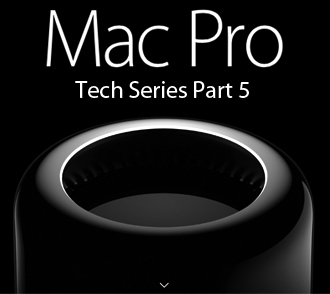 Mac Pro 2013 Tech Series Part 5: PCIe cards, expansion chassis and other peripherals. - Sewelltech, Inc.
Mac Pro 2013 Tech Series Part 5: PCIe cards, expansion chassis and other peripherals. There’s a lot of excitement about the new Mac Pro 2013 and there should be: it’s the first redesign of the workhorse Mac in seven years. In our previous post we showed you what the Mac Pro 2013 looked like now lets examine the nitty-gritty details and specifications, and answer a few questions. Today in Part 5 of a 6 part series we will talk about PCIe cards, expansion chassis and other peripherals. Learn about using PCIe cards, expansion chassis and other peripherals with your Mac Pro 2013 computer. The Echo Express III-D from Sonnet supports three single-width, full-length PCIe cards, or one double-width, full-length card plus one single-width card, enabling it to support every Thunderbolt-compatible card available. PCIe 1.1, PCIe 2.0, and PCIe 3.0 cards are supported. Sonnet also has the Echo Express SE II which lets you connect Two PCIe Slots—Support two half-length+ (up to 7.75″ long), full-height, single-width cards. Connect to a Fibre Channel SAN. SANLink2 is a compact device that allows a Thunderbolt™ 2 host computer to directly connect to a Fibre Channel SAN. Channel ports and the 20Gbps speed of Thunderbolt 2, SANLink2 introduces an entirely new storage connectivity that the world has never before seen – until now. The Pegasus2 is the fastest and the only Thunderbolt 2 enabled hardware RAID storage available in the market. Showcasing Intel’s revolutionary Thunderbolt 2 connectivity, the Pegasus2 boasts a staggering speed of 20Gb/s – more than enough to effortlessly handle and accelerate any 3D or 4K (Ultra-HD) workflow environment. Give Your Storage a Thunderbolt Upgrade.